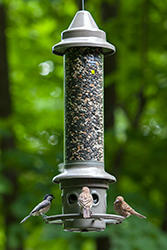 Protect your bird seed bounty from squirrels with our Eliminator™ bird feeder. When a squirrel touches the perch ring, its weight closes the seed ports, foiling its seed-stealing plot. The Eliminator's unique technology allows you to set the sensitivity level, so you can also exclude large birds such as pigeons or doves. It's easy to hang, holds three and a half quarts of seed and is backed with a limited lifetime guarantee. This feeder also features a special seed ventilation system that helps keep seed fresher. It's easy to hang, holds about three quarts of seed and is backed with a limited lifetime guarantee. The Eliminator can be disassembled and assembled with no tools, and all of its parts are top shelf dishwasher safe.